Once widespread and common, the Brown Hare (Lepus europaeus) has been faring less well in recent times. Their population has declined over the last 50 years and, as a result, the species is listed as a priority for conservation action in Scotland. 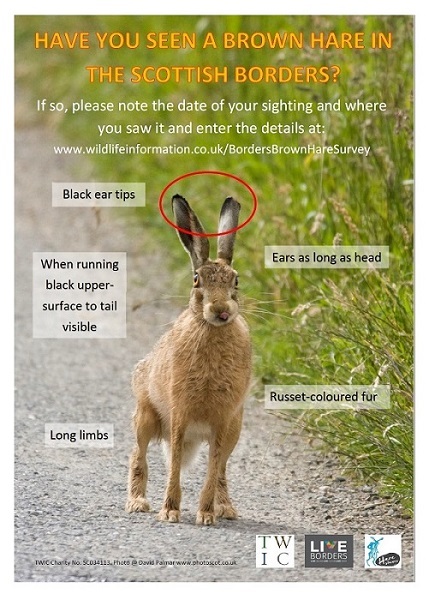 Please help us update our dataset on where Brown Hares are found by submitting your sightings to the Scottish Borders Brown Hare Survey. The Brown Hare is usually found in open countryside, in grassland and on farmland and although mainly nocturnal, the species is also often active around dawn and dusk. Unlike Rabbits, Brown Hares do not dig burrows, but instead create a shallow depression to rest in. This is called a “form” and is often made among long grass or woodland. The preferred diet of the Brown Hare is wild grasses and herbs, but crops are also taken, so some land managers regard them as pests and control their numbers. In Scotland, it is legal to shoot Brown Hares during the open season between 1 October and 31 January. At other times, shooting is illegal, unless a special licence is granted by Scottish Natural Heritage. The Brown Hare may be confused with the Rabbit (Oryctolagus cuniculus) or with the Mountain Hare (Lepus timidus). Compared to the Rabbit, the Brown Hare has a larger body, longer limbs, larger ears with black tips and russet-coloured fur. The tails differ too; Rabbits hold their tail upright when running revealing the white underside. In contrast the Brown Hare holds its tail down when running showing the dark upper surface. Rabbits are usually found in groups and close to cover but the Brown Hare is more solitary and often seen in the open. The Mountain Hare replaces the Brown Hare in upland areas (above 500m). It is slightly smaller than the Brown Hare, has relatively short ears (shorter than head) and an all-white tail. In Scotland in mid-winter, the coat of the Mountain Hare turns white, making it unmistakable. For more information on telling the three mammals apart download our Factsheet. The Brown Hare was introduced to Britain during Roman times, so, strictly speaking, it is not a native species. However, most people now consider it a welcome addition to our biodiversity. Once widespread and common, data show that the UK Brown Hare population has undergone a significant decline over the last 50 years. Factors such as agricultural intensification and increased predation from Red Fox may have contriubuted to this. Data held by TWIC show that the Brown Hare is still widespread in the Scottish Borders, but there are a number of areas where the mammal has not been recorded since before 2000 and we are especially keen for sightings from these areas. The Brown Hare is a UK Biodiversity Action Plan Priority Species and is included on the Scottish Biodiversity List. This means it is a priority for conservation action in Scotland. iRecord is straightforward to use and allows photographs to be uploaded with sightings, so please have a go! You can submit wildlife sightings as a guest, but we would encourage you to register on the website so that you can view your previous records and use all the site’s facilities. It is free to register. Those who enjoy more targeted recording can help us by reporting Brown Hares from areas where the animal has not been reported since 2000. Download the list of tetrads (2 km squares) here. If you are unable to use iRecord, please complete our recording form and email it along with any photos to natalie@wildlifeinformation.co.uk. These sightings will then be added by TWIC to the Scottish Borders Brown Hare Survey iRecord activity. All records will be verified by the Local Mammal Recorder before being uploaded to the National Biodiversity Network Atlas Scotland and shared with relevant recording schemes. Photograph of Brown Hare © David Palmar www.photoscot.co.uk. This survey is a joint initiative with Live Borders.